Funny you should mention the knife being from Spydercos Taiwan plant and how you wouldn’t know it was from there by the quality. I was just discussing that very same topic with my local knife dealer during my monthly “Knife Fix”. He told me that the Taiwan plant has the biggest and most strict QC departments in the biz and it shows in examples like the Sage and this beauty. Thanks again for the site and another well written review, keep em’ coming ! I’m so glad this review was helpful. It makes my day when I hear that one of my reviews has helped someone make a decision on purchasing a knife. You won’t be disappointed with this knife. This and one other Spyderco has been on my radar. Perhaps you can help me out? 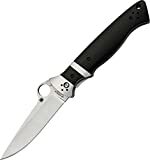 After reading this review I thought, “Yeah, this is the one..” but upon going to the site to window shop it another Spyderco captured , or I should re-captured it and they are similar in that they are both hefty, solid and substantial looking. Have you ever handled the Spyderco Lil LionSpy or the LionSpy? These models have been on my mind for a while now and you kinda rekindled my obsession but its hard to pull the trigger because one, they’re not cheap and two, even my awesome local knife shop never has any of them on display where I can handle them. Thank you in advance! I don’t have any personal experience with the LionSpy or Lil LionSpy, so I couldn’t give you an honest assessment. Yes, it is a beast, but it is one of the sturdiest folding blades I own (and I own waaaay too many). Also, if you practice, you can get Emerson “Wave-like” opening out of the pocket – even though this has no wave. I was actually considering having the Spydie hole ground out in front to make a wave. I have since decided against that – for now.